There is a place in all of us called Montana. You know Montana when you see it. It's authentic, distinctive and uniquely American. And it carries with it a spirit of the great western frontier that still thrives in places you can't find on any map. The qualities that make Montana great are the same qualities you will find in every piece of handcrafted silver from Montana Silversmiths. Silver has long been synonymous with the American West. A tradition forged in the early days of prospecting and the silver claims that created fortunes. 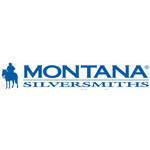 This heritage is honored each and every day at Montana Silversmiths® in the Montana-made western buckles and jewelry crafted by their skilled engravers. For nearly 40 years, Montana Silversmiths has focused on producing and offering products of exceptional value. Nestled in the tiny hamlet of Columbus, MT, they've grown to become the largest supplier of western jewelry, watches, home décor, and legendary buckles to the industry. Handcrafted silver, rich in western heritage, is the very core of Montana Silversmiths. Their skilled craftsmen are the finest in the western industry, crafting products that are a combination of traditional western designs, unique modern flair, crisply executed engraving styles unmatched in their brilliance, and a keen attention to detail. Montana Silver products are touched by as many as twenty-five caring sets of hands before they are packaged in blue velvet boxes for presentation. The quality they achieve by such careful workmanship is one reason their products are known as compliment makers and desirable gift items for individuals and loved ones.